This is a very, very complicated problem, and I am not an expert. Wikipedia has a good article on it. This will probably come up with the Congressional revision of the Endangered Species Act, HR. 717. This act changes the one year consideration period to as immediate as possible, and to take up requests in a priority order, rather than a filing order. But mainly, it says that the economic cost of the order has to be considered, not just the protection of a species. 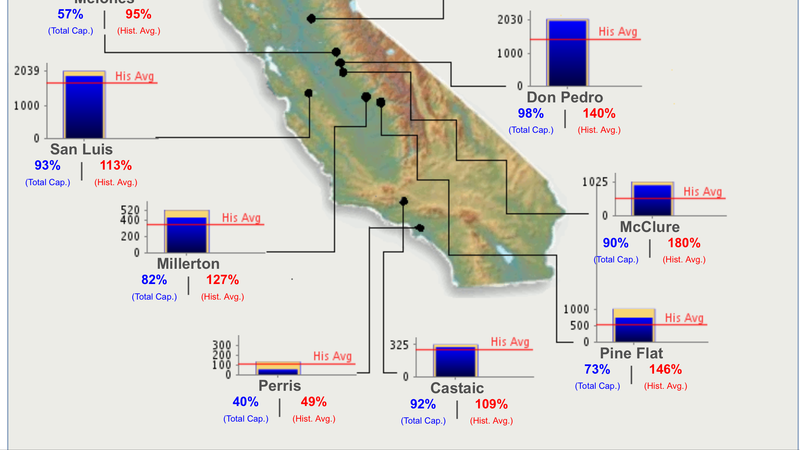 The California water projects get a lot of fresh water from the Delta, up to 25%, sent south to farmers and cities. What is often ignored, is that a lot of the water flow to the San Francisco Bay is to keep out salt water to the Delta from the ocean, at least during the summer, since the Delta has been sinking, and is below sea level. There are 74 kinds of fish in the Delta, including two thirds of California’s salmon, which use the Delta to go upstream to spawn. The endangered fish is the delta smelt, which unfortunately, has been dying off anyway, by unknown factors. This keeps water flowing to the Bay and ocean, and limits fresh water diversion. There are also farmers on the Delta who use the non-diverted water, and an involved, multi-species ecology, including being a stopover for migrating birds. When President Trump came to California last summer and met with central valley farmers, he came away saying that there was no drought, and he knew how to solve the water problem. Fact check, we had a five-year serious drought. But what he must have been told, is that without the delta smelt being listed on the endangered species list, farmers and cities could have gotten all they water they needed. There was no record of Trump consulting with state water officials, or environmental groups, or heaven forbid, reading any report about the drought and the Delta. So, we expect the disappearing delta smelt to be on the chopping block, since the total value of California farming is something like $45 billion a year. Not being an expert, I do not know if the delta smelt might be transferred to a lake, or a Northern California river which is not being tapped for fresh water. If it could be, somebody would have tried it by now. 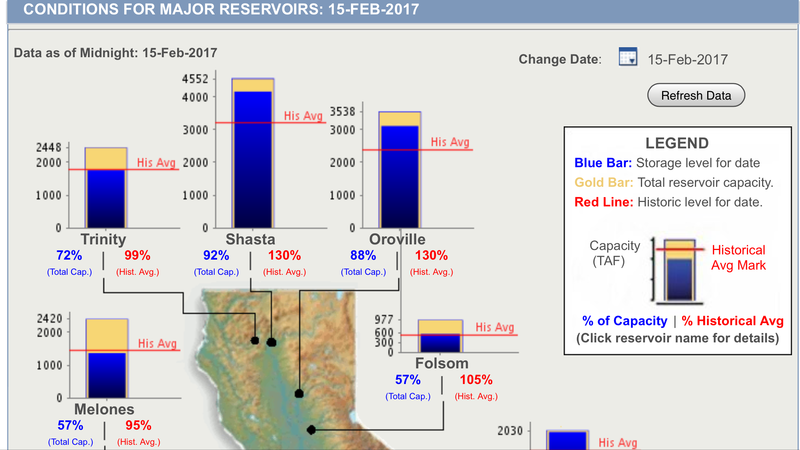 The water urgency has completely reversed this year, since abundant rainfall and snowpack have reservoirs overflowing. A diagram of the full reservoirs is below. This has still a negative effect on central valley farmers. They have paid for water now being held in the reservoirs. If the water has to be released to streams to prevent reservoir overflow, they lose some of the water that they have paid for. Water rights are fixed by law, so I don’t even want to suggest a system to prevent the monetary loss. Even though the delta smelt has been made to bear the brunt of the legal struggle, much more is at stake in draining the Delta, as we have explained above, and the fate of the full system should be carefully taken into account. 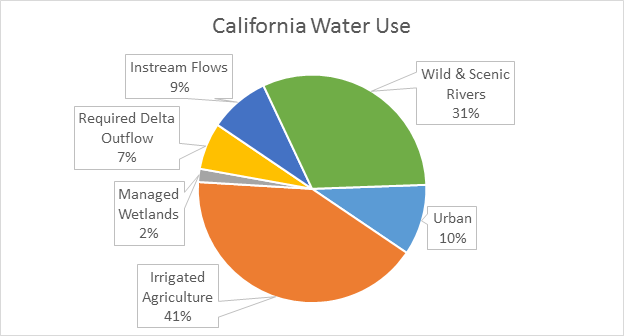 The breakdown of California water use includes 41% going to farming, and 10% to cities. The amount going to maintain the Delta is only 7% of the total. So it does not solve the farming problem, and, at most, could only be 1/6 of that needed for farming, if the whole Delta was sacrificed. Below is the breakdown of California water use. This entry was posted in California Sacramento-San Joaquin River Delta, California Water, Donald Trump, Politics, Trump Administration. Bookmark the permalink.